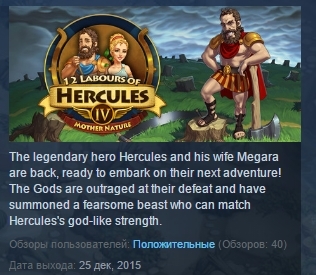 The legendary hero Hercules and his wife Megara are back, ready to embark on their next adventure! The Gods are outraged at their defeat and have summoned a fearsome beast who can match Hercules´s god-like strength. The beast has trampled the countryside, turning lush gardens into desert wastelands! Restore the world´s beauty by using everything at your disposal, from Megara´s magical abilities to even a fire hydrant! Team up with friendly allies like King Midas and Epeius with his famous Trojan Horse to save Mother Nature from destruction.